No, it’s not out of a sci-fi movie, but actually quite handy for a variety of applications. The best plasma cutter is lightweight, yet powerful, and able to efficiently cut a wide variety of metals and alloys. It needs to have a long reach, and be designed to allow for cutting in tight spaces. Plasma cutters are a lower fire hazard than acetylene torches, and will be many times lighter than dragging around a set of torches. As with any tool, the manufacturer can be very important, and the two top ranked picks both come from well established and professionally trusted companies which specialize in cutting and welding equipment. Keep in mind that a plasma cutter needs to have a compressed air source such as an air compressor, and the psi available will affect cutting behavior. Obviously, proper welding clothing needs to be worn including a good welding helmet. For those just starting out, see our Intro to Plasma Cutting. At about 21 pounds, the Powermax 45 is stout enough for heavy use, yet light enough to move around the shop or job site. The 15-foot torch cord is one of the best features, because positioning the Powermax is faster and doesn’t have to be done as often. The low profile cutting head makes it easier to reach into cramped spots, and the finger or thumb trigger action gives you more versatility while you work. Whether you only do a little metal work, or do so on a daily basis, you will find features on this model that exceed what you would expect in such a compact machine. One of the best features is the conical flow design which shapes arc density for smoother, cleaner cuts (up to 5/8-inch thick). 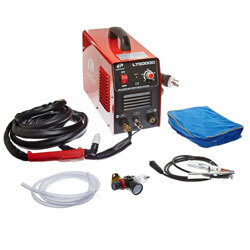 Like most plasma cutters, this unit requires a compressed air source with a 4 CFM @ 80 PSI flow rate. 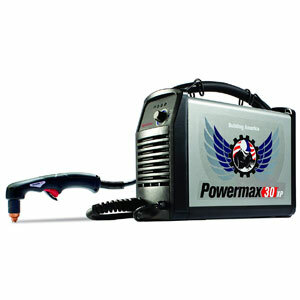 Note: The Powermax30 AIR model includes an on-board air compressor at a slightly higher cost. The biggest drawback with this model is obviously the price but visit any plasma cutting forum and Hypertherm is consistently mentioned as one of the best brands in plasma cutters and well worth the premium price. Another thing to consider is that it does not come with many accessories or companion tools. The recommended consumables will cost a little more than the competitor, but Powermax’s patented design uses less, and the savings will add up over usage. 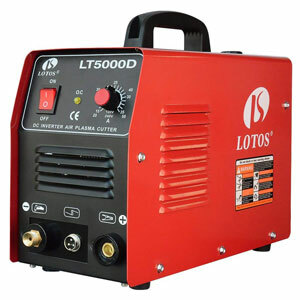 If just starting out with plasma cutting and having a good quality and cheap cutter are your primary requirements, the LT5000D might be the best option for you. It only weighs about 22 pounds, which means you can easily move it from one project to another. Be careful not to underestimate this cutter, though. It is fully capable of cutting almost any type of metal or alloy up to 1/2 of an inch thick with it’s 13-foot torch. Rated for a 1/2-inch clean cut and 3/4 severance thickness, recommends using an air compressor capable of 3.8 CFM @ 66 PSI but users have had success using small pancake style compressors rated right around 3 CFM. The small chassis cranks out up to 50 amps of current, and that is more than enough for just about any cutting job you need to do. This unit also features a patented cooling system to help you work faster and longer. The torch cord length is a bit of a disappointment, so you’ll be needing to do a bit more repositioning while working compared to the Hypertherm Powermax above. Also, while the price is great up front, prepare to spend a bit more on consumables than some of the more expensive units.